An extended version of this article was originally published under the title, "How the West Destroyed Libya." 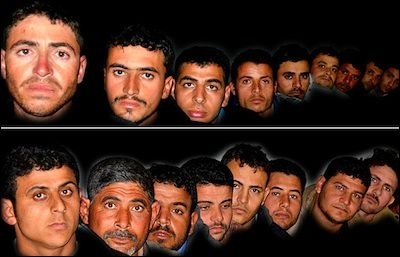 Images of Coptic Christian hostages held by a Libyan affiliate of the Islamic State group. That jihadis and other ISIS-type militants gained the most from Western intervention in Libya four years ago cannot be denied. Simply looking at the treatment of Christian minorities—the litmus test of the radicalization of any Muslim society—proves this. Thus, today, Monday, January 12, "A Libyan affiliate of the Islamic State (ISIS) has claimed the abduction of 21 Coptic Christians and released pictures of the captives." It is not clear if these 21 are in addition to the 13 Christians kidnapped days earlier on January 3. According to Hanna Aziz, a Copt who was concealed in his room when the other Christians were seized in Libya, "While checking IDs, Muslims were left aside while Christians were grabbed…. I heard my friends screaming but they were quickly shushed at gunpoint. After that, we heard nothing." Three of those seized were related to Aziz, who mournfully adds, "I am still in my room waiting for them to take me. I want to die with them." Such atrocities were unheard of under Moammar Gaddafi's "authoritarian" rule. A few days earlier, also in Sirte, Libya, a Christian father, mother, and young daughter were slaughtered reportedly by Ansar al-Sharia—the "Supporters of Islamic Law," or the Libyan version of ISIS that rose to power soon after the overthrow of Moammar Gaddafi. On December 23, members of the Islamic group raided the Christian household, killing the father and mother, a doctor and a pharmacist, respectively, and kidnapping 13-year-old Katherine. Days later, the girl's body was found in the Libyan desert—shot three times, twice in the head, once in the back (graphic images here). As for motive, nothing was stolen from the household, even though money and jewelry were clearly visible. According to the girl's uncle, the reason this particular family was targeted is because "they are a Christian family—persecuted." In short, as I wrote nearly a year ago, it continues to be "open season on Christians in Libya." In February, 2014, after Ansar al-Sharia offered a reward to any Benghazi resident who helped round up and execute the nation's Coptic Christian residents, seven Christians were forcibly seized from their homes by "unknown gunmen," marched out into the desert and shot execution style some 20 miles west of Benghazi (graphic pictures appear here). Days later, another Coptic Christian, Salama Fawzi, 24, was shot in the head while unloading food in front of his grocery stand in Benghazi, again, by several "unknown gunmen." And the day after that, a corpse was found, believed to be that of another Copt—due to the small cross tattooed on his wrist traditionally worn by Egyptian Christians. This is to say nothing of the churches attacked, of Christian cemeteries desecrated, and of 100 Christians—including Western ones—arrested, tortured (some dying) for possessing Christian "paraphernalia" (like Bibles and crosses) in the post "Arab Spring" Libya the Obama administration and its allies helped create. Needless to say, such atrocities were unheard of under Gaddafi's "authoritarian" rule (just as they were unheard of in Saddam Hussein's Iraq). As previously mentioned, Muslim persecution of Christians is the litmus test of how "radical" an Islamic society has become. Thus, in all those Mideast nations where the U.S. and its Western allies have interfered recently—Iraq, Egypt (under Morsi), Libya, and ongoing Syria—the increase of Christian persecution there is a reflection of the empowerment of forces hostile to everything Western civilization once stood for.